I loved these cupcakes even though I only had a small bite, as they are not gluten free. I suppose you could adapt them to be gluten free by using a gluten free flour blend, but I have not yet tried it myself to confirm the results. If you happen to give it a whirl, please let me know! I loved how these came out as a gluten laden cupcake because the cake was so rich with chocolate yet light. The fluffy peppermint mocha buttercream was made with flavored creamer, as opposed to the usual milk, half & half or cream. Using the creamer gave it the same richness with added flavor. Preheat the oven to 350F degrees. Line a 12-cup cupcake/muffin pan with cupcake liners. In a microwave safe bowl, combine the butter and chocolate. Place in the microwave and melt for 30 seconds - 1 minute, stirring to combine. Add the espresso powder and stir to dissolve. Set aside to cool. In a medium bowl, whisk together the cocoa powder, flour, baking soda, baking powder, and salt until combined. In a large bowl, add the eggs, sugar, brown sugar, vanilla extract, and peppermint extract. Whisk everything together until smooth and well incorporated. Add the melted chocolate and butter mixture and continue whisking until well incorporated. Add half of the flour mixture to the batter, followed by half of the buttermilk. Whisk to combine. Add the remaining half of the flour mixture to the batter, followed the rest of the buttermilk and the 1/2 cup Trader Joe’s Peppermint Bark Baking Bits. Whisk to combine but do not overmix. The batter will have the consistency of pudding. - If the frosting is too thick for your preference, add more creamer. 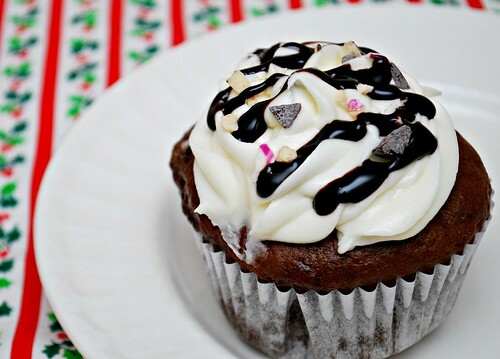 To decorate the cupcakes, frost the cupcakes with the frosting. 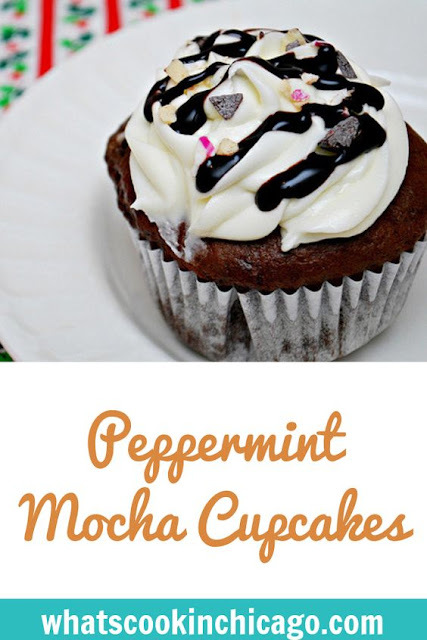 Drizzle the tops with chocolate sauce and a sprinkling of the peppermint candies. Oh, these look absolutely wonderful! These look fantastic! I love anything that involves chocolate and peppermint. It will be lovely to have your family visiting and spending time with you and Joel.